Good health is a precious resource for every Queensland family. The proposed Healthy Futures Commission will be a new way of working that will contribute to reducing health inequity for Queensland children and families. Childhood is a crucial time for setting lifelong behaviours so the more we can do to empower and help young Queenslanders and families, the better chance we have at reducing obesity rates across the state. On 23 May 2017, the Healthy Futures Commission Queensland Bill was introduced to the Queensland Parliament. The Bill was referred to the Health, Communities, Disability Services and Domestic and Family Violence Prevention Committee and their report (PDF, 1.72MB) was tabled on 24 July 2017. Following passage of the Bill and appointment of the governing Board, the Commission is expected to be operational in the first half of 2018. The Commission will contribute to reducing health inequity for Queensland children and families and will be funded $20M over three years. It will provide grants and partner with local business, community organisations, academic institutions and government agencies to encourage and support regular physical activity and healthy eating. By investing in innovative ideas through local community partnerships and other initiatives, the Commission will create environments and opportunities that support the health and wellbeing of children and their families. 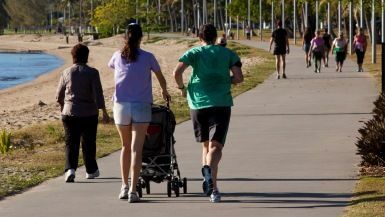 The Commission will comprise a six-member board, a Chief Executive Officer and up to 15 staff, who will address two key outcomes from My health, Queensland's future: Advancing health 2026 (PDF, 2.25MB): reduce childhood obesity by 10 per cent; and increase levels of physical activity for health benefit by 20 per cent. Further information about the Healthy Futures Commission is in the Bill (PDF, 374KB), explanatory notes (PDF, 224KB) and explanatory speech (PDF, 176KB).